You've planted your dahlia tubers, you've weeded your dahlia garden, and now you're looking forward to the rewards. With dahlias in bloom or just about to bloom, it's time to think about how to make the most of your dahlia flowers when you bring them indoors. Whether you're going to float one of your show-off dinner-plate dahlias in a console bowl, make a nosegay of miniature dahlias, or create a stunning dinner-table or cathedral-style arrangement, the first steps—cutting your dahlias and conditioning them—are important. One of our dahlia-growing friends, Shirley Beélik of Shelton, cuts dahlias every week to share with the congregation at Saint David's Church, and her bouquets last like anything because they're well conditioned. 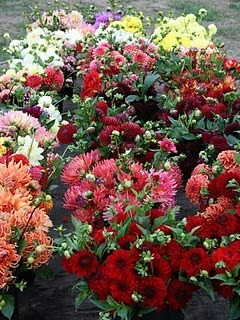 (So, we might add, are the dahlia bouquets Lynch Creek Farm sells at the Olympia Farmers Market.) Shirley's bouquets are featured in this posting, and we're sure you'll see more in posts to come. Arranging dahlias, like arranging most garden flowers, requires some planning ahead, because your beautiful dahlias will stay lovely longer if they're conditioned overnight before you make your bouquets. Small dahlias are easier to arrange in bouquets than larger ones. You'll need sharp shears, a bucket, and if you choose to use it, a flower flower food. A mister or spray bottle with a fine-spray setting will be useful, too. Cutting dahlias is best done early in the morning or in the evening. Fill your bucket with lukewarm water. Be sure your scissors or secateurs are sharp; crushing the fibers of the stems will make it hard for the dahlias to take up water. Choose flowers that are fully open or close to it, with firm, well-filled centers; dahlia buds rarely open after they're cut. Make your cut just above a set of leaf nodes and side buds to encourage reblooming on the plant, but try to have as much length of stem as you can for ease in arranging. Recut the dahlia stems under water, either in the garden or immediately after taking them indoors. This keeps the dahlia from having its stem flat against the bottom of the container and ensures that it will absorb all the water it needs. Dahlias are hollow-stemmed and many of the varieties exude a sap which tends to harden on the cut tissue. If you see a whitish or milky sap coming from the stem ends as you cut them, try searing the ends of the stems with a lighter or candle. This will also enable them to take up water better. 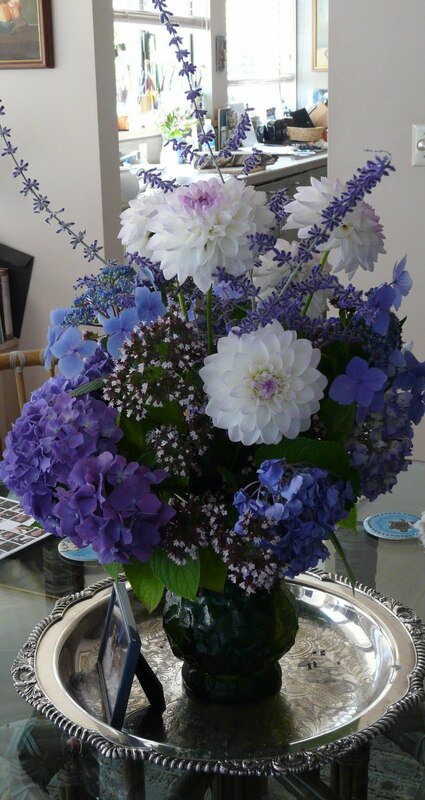 Stand the dahlias in deep, lukewarm water in a cool dark place overnight or for eight hours before arranging them. If you wish, use a preservative or "flower food" solution. It's counterintuitive to use warm water on flowers; we think of cool as refreshing. But the plants are growing in warm conditions, and cold water (or hot water, for that matter) will shock their systems. 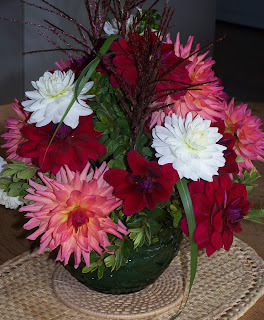 When arranging dahlias, strip off all the leaves that will be below the water line in your vase. In water, the leaves will begin to decay, and the bacterial growth will migrate to the stems, causing them to lose their water-bearing quality. 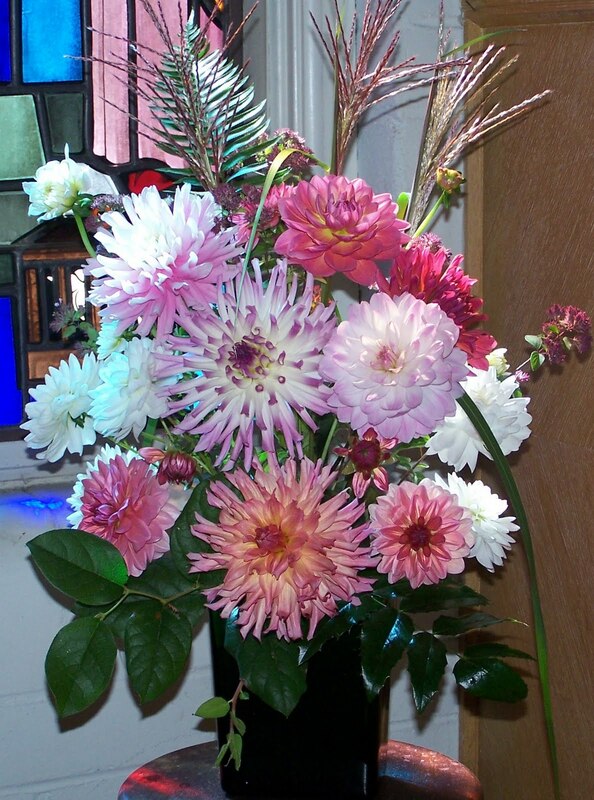 You can arrange dahlias in florists' foam, but they won't last nearly as well as they will in a vase full of water. You can mix dahlias with other flowers, often with stunning effect, but they'll last longer in their own company—something to do with the different bacteria on different plants. To keep your dahlia arrangement looking its best, mist it daily. Spray sparingly with a fine spray, but do not allow the flowers to become wet. Display it in a cool place away from strong light, drafts, and ethylene sources (a window over a busy street with auto exhaust, for instance, or bowls of ripening fruit), and appliances like televisions whose heat, though slight, can dry the bouquet. Recut stems daily, and change the water/preservative solution at least every three days. This way you'll be able to enjoy your dahlias–and share the delight–for the longest possible time. A Bud - And Some Bugs - on my Dahlia!